I’m a real lady, sleek plump, round and soft as a plush pillow. I keep myself clean and tidy just like a lady! I was rescued earlier this year from a really bad situation. 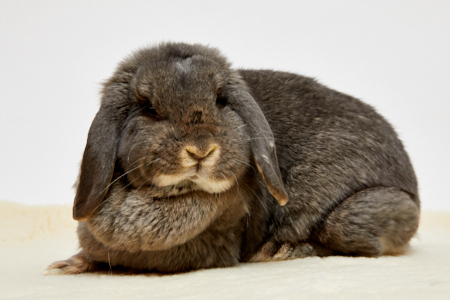 Five other French lop ladies and myself were being used by breeders. There was a lot of sadness and neglect. We were mishandled and they took our babies away. I was weary and losing hope. Then we were brought here to this wonderful place, SaveABunny, and given new hope and the start of a new life! I’ve put that sad part of my life behind me now and I’m eagerly looking forward to a new life of happiness in my own special home with someone special like you! I'm currently being housed at SaveABunny waiting to be adopted.